Viva San Juan del Sur! AUGUST 2018: Despite the turmoil in Nicaragua, the Sister City Project continues its work with people who need it most. The all-clay EcoStoves (https://www.flickr.com/photos/gringopinolero/albums/72157662605616337) and the BioSand Water Filters continue to be fabricated by participating families, under the watchful eyes of Antonia Mendoza. And the Free High School for Adults keeps functioning, even at a time when many schools and universities in the country are closed. We keep faith with the people of Nicaragua. Click here under OUR STORY to see a list of our MAJOR ACHIEVEMENTS in San Juan del Sur in the past 30 years. And click here to see the FALL 2018 NEWSLETTER. THESE GLASS-FRAMED PHOTOS OF FOLKS FROM SAN JUAN DEL SUR ARE NOW FOR SALE. CLICK HERE TO SEE THEM AND READ THE CAPTIONS. TO SEE PRICE LIST AND LEARN ABOUT DELIVERY OPTIONS, CLICK HERE. This is Yeseling Ariana Solis, 23 years old, in the restaurant where she cooks. Yeseling had been a victim of domestic violence as a child. Her parents separated when she was six-years old and her grandmother raised her in a house where there was never enough money. After she got her sixth-grade diploma at thirteen, she went to work washing clothes in the houses of strangers. When she was 17 she met the man who she would later marry, and he supported her in that he was willing to buy her notebooks and clothes so she could go back to school on Saturdays. On weekdays she was a street vendor, selling pretzels, powdered cornmeal, and pinol (a rural drink) that she made herself. After Yerik was born, she continued to do this while pushing him around in a carriage. Without the Free High School, Yeseling might still be washing clothes or selling snacks on the streets. Now she is educated, has a decent job, and is progressing down a rewarding career path. Most importantly, she is empowered. This is the kind of difference in people’s lives that we’ll be making by supporting the school. Thanks for being part of that difference. And read about us in MassRealty: http://www.massrealty.com/articles/helping-our-friends-overseas,-part-1-featuring-san-juan-del-sur-city-project. 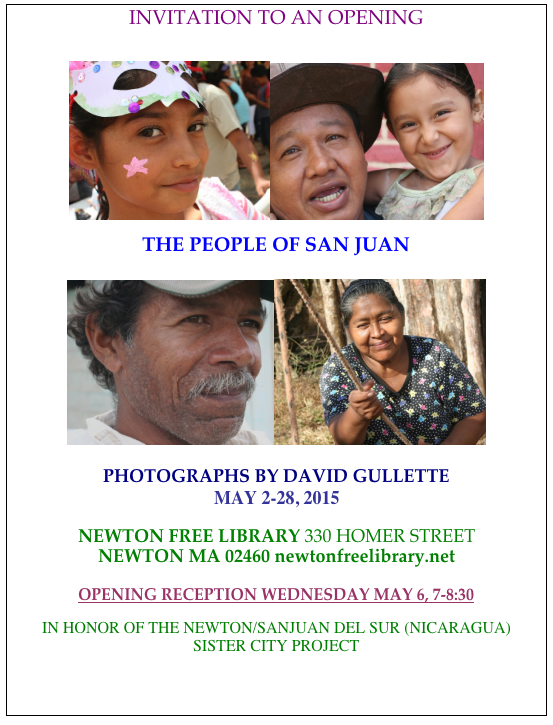 San Juan del Sur, Nicaragua has enjoyed a “Sister City” relationship with Newton, MA since 1988. For over a quarter century, the Newton/San Juan del Sur Sister City Project has pursued its mission of improving health and education in tandem with grassroots organizations and dedicated individuals there. We have financed the building or renovation of over twenty schools, improved the health of communities surrounding San Juan bay by bringing simple, eco-friendly technologies to the families of San Juan, and offered literacy programs and adult education programs to hundreds of people who are excluded from the regular school system. These efforts are changing the health, economy, and culture of the region. In 2013 the Free High School graduated another 74 students, for a total of 616 since 2002. In 2014 we admitted over 800 students, via the rural high schools, the in-town or “Saturday School,” and the Technical Institute. For the first time, the City Council and the Ministry of Education are offering partial subsidies for these programs. Two recent projects are the installation of BioSand Filters for purifying contaminated well water, and EcoStoves, for cooking with wood without filling the home (and folks’ lungs) with smoke. The photos in the slideshow below showcase communities where one or both of these initiatives were underway in 2010/2011. See SEPTEMBER 2013 UPDATES on RECENT NEWS page! See our Spring 2013 Newsletter! MORE NEWS FROM 2013: SEE OUR “RECENT NEWS“! SPRING 2013: Our March 22nd “12 by 12” art show and silent auction brought together many Sister City Project supporters, local artists, past travelers to SJDS, educators and friends, and raised much-needed funds for the Free High School for adults. SUMMER 2012: We’ve completed our second “Green Preschool,” this time in the village of San Antonio de Baston. See a slideshow about the building project including the school plus the “Comedor” or lunch room, constructed using locally-sourced, sustainable materials. January 2011: The rural students of the Free High School and their teachers usually meet in elementary schools in the villages where we offer classes. This means that the chairs with arms (pupitres) are sized for children between the ages of six and thirteen, and too small for many of our adult students. 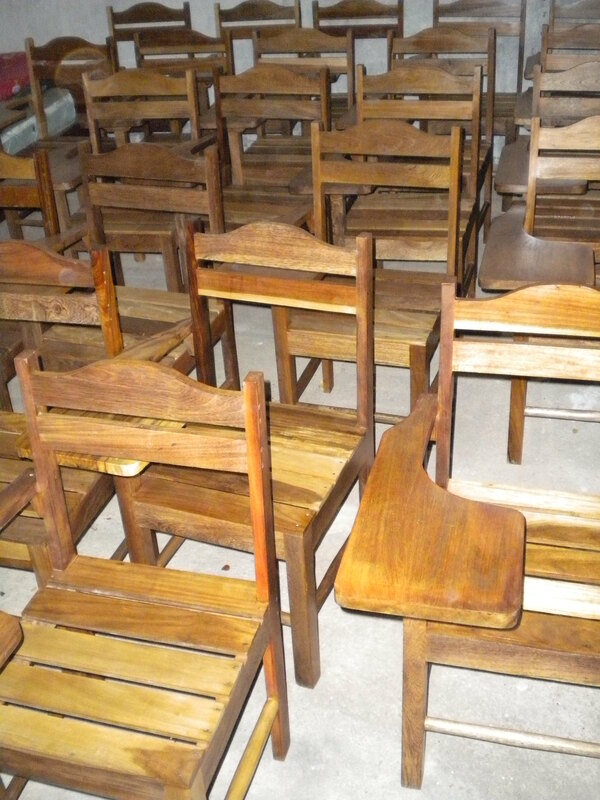 Many chairs are old and falling apart. We needed new pupitres of the right size. Newton Highlands Congregational Church came through for us, purchasing over eighty in 2010. Thanks to Rodney Barker, Lynn Scheller, Carol Carroll, and other members of the Mission Ministry: Marianne Talis, Heidi Frimanis, Carol Jensen, Marian Reynolds, and Lynne Sullivan. The chairs are made in San Juan del Sur of certified wood that has been cut down according to ecological standards set by the Nicaraguan environmental agency. They were made in the workshop of Jose Ruiz, out of two hardwoods, laurel and roble. Your tax-deductible contributions make our work in San Juan del Sur possible. This woman's dream is to become a professional in order to be an example to her child and her people.